Something is going on in the North Atlantic. Paul Homewood notes the region is cooling rapidly and it is not just surface cooling, it applies to the 700m depth that Argo buoys measure. Graphs thanks to Ole Humlum. To give it some perspective that cooling is back to temperatures of about 20 years ago (see below). This is localized, not global, but still interesting (rather especially to our European friends). This is the area mentioned in a recent study on solar winds which found faster solar winds correlate with a cooler north Atlantic. A year ago a different paper predicted colder times were coming to the North Atlantic due to natural cycles. A paper by Robsom et al in the last couple of weeks said that the cooling trend was clear, started in 2005 and really shouldn’t have happened if man-made aerosols were controlling the North Atlantic. The observed cooling is not consistent with a dominant role for surface heat flux changes due to anthropogenic aerosols12. Anthropogenic aerosol loads have decreased in the North Atlantic region since the 1990s, and would therefore be expected to have induced warming of Atlantic SSTs26, in contrast to the observed cooling. Finally, the deep Labrador Sea density is still anomalously low, and has decreased over the past decade (see Fig. 1), albeit at a slower rate. Given the lag between the deep Labrador Sea density and the upper ocean (that is, Fig. 3), we would expect some further cooling of the North Atlantic to take place, in agreement with other studies11,14,16. If the North Atlantic cools further this is likely to favour reduced rainfall in the Sahel region3 and drier summers in Northern Europe4, as well as a continued suppression of hurricane numbers2. Furthermore, the continuing cooling could have important implications for the Interdecadal Pacific Oscillation, and possibly global mean temperatures30. Looking further ahead, the EN4 analyses also suggest that the observed cooling of the upper SPG is associated with a small increase in upper ocean density (not shown). This increase could be the first stage in the next phase reversal of Atlantic Multidecadal Variability, as suggested by simulated mechanisms of natural internal variability10,22. Therefore, monitoring and predicting the continuing changes in the Atlantic Ocean, and the links to other regions, remains a key priority. For years has been cooling not warming. We should all buy V8s to a/. Warm the planet by pumping out more CO2… (Doesnt work anyway) and. B/. Use more fuel to save the struggling oil industry. And thus the pendulum swings. And it will swing further yet. Not really, cooling of the North Atlantic is a direct consequence of Greenland ice cap melting. The model predictions are proving correct again. Oh dear, poor CS, things aren’t working out too well for your scaremongering, are they, poppette. Please explain why its cooling FROM BELOW. And the Greenland SMB is somewhat ABOVE AVERAGE. Notice how CS totally avoids the REALITY. Posts an inane comment instead. Zero science to offer, as usual. up-down, top-bottom, hot-cold etc etc . . ha ha. It won’t be long until one of your climate mates says that 97% of the models predicted a cooling trend. Hahahaha keep dreaming Noddy, eventually you will have to wake up. Why are you posting stuff from the build-up of the El Nino. Are you deliberately trying to display your ignorance? I’ll leave that to you Noddy, you seem to be the specialist in that field. Empty post.. zero science from CS.. Nothing unusual in that, is there. DATA is you enema, CS. !! You are becoming incoherent Noddy. Still the ZERO, empty science from CS. Sorry you are incapable of understanding basic English. Sorry to be pedantic, but there are two letters missing – and an apostrophe. It should be “you’re”, not the simple pronoun “you” nor the possessive pronoun “your”, but the phrase, “you are”, truncated to “you’re”. See how little of that NATURAL, NON-CO2 heat is left now. Say bye-bye to the El Nino. Still floating around in the clouds I see. You took the wrong tablet this morning. Your mind is obviously EMPTY ! And you are well past yours. It really is yesterdays news. I come here to read the latest climate gossip, not the stuff everyone was talking about last year. Why is it your whole life you have failed to produce anything of relevance? And thanks for confirming.. its been cooling and it is STILL COOLING in the North Atlantic, as the DATA clearly shows. Do you have another point to make against your AGW agenda? STILL waiting for you to produce something that shows that the DATA that Jo has posted is incorrect. Do you have ANYTHING except meaningless bluster? So what happened to the Antarctic sea ice this year? Arctic at record low, sea temperature off the east coast at record highs. It must be hard to find somewhere to look for reasurance Noddy. NO WARMING in the Antarctic in the whole satellite data record. Southern ex-tropics (mostly oceans)…. no warming for 20 year..
Have you got anything to back up anything you say ??? That’s convinced me then. There must be some huge world-wide warmist conspiracy by all those scientists, its the only explanation that makes any sense. “Please explain why its cooling FROM BELOW. Come on CS… you must have something… even a whimper would do !! Who says its cooling from below? Link? The information is in the Paul Homewood link. Go and LEARN… if you are capable of it ! Oh, must be right then if its been said by another blogger with no qualifications. Come on Noddy, wake up Noddy. Oh dear, too much DATA for you to comprehend. Hahaha one blog quoting data from another blog and there it is, proof it must be right, and Noddy just keeps nodding. The ARGO data graph too much for you. I understand it would be. You have shown you are not all that intelligent. If we sum the localised areas, we may come up with a very large area!!!! If you “sum the localised areas”, you are actually adding them together, by stealth. Such an act, becomes perilously close to being mathematics, an anathema to Gaia, since it paves the way to Science and other heresies. This change to a cooling phase is just part of the cycles identified yrs ago by Dewey in his book on Cycles. He identified 25-30 yr cycles of hot wet, hot dry, cold wet, cold dry. We appear to be moving from the latest hot cycle to a cooler one. These cycles on top of the general warming from the little ice age, correlates very well with our temperature records over last 150 yrs. Yes, the cold is coming. Pay attention to global food production. My thought , as a mere layperson, on seeing the significant hump in the heat content curve was to wonder what happened to that heat . Was it radiated off planet? conveyed to polar regions to accelerate arctic ice melting? or did it warm the air on adjacent lands ? Climate scientists and “heat” are playing a game of hide-and-go-seek. “Heat” is winning. I am not sure that Jo will approve of a sentence that conjoins the words “heat”, and “hump”. This a family blog, after all. Don’t panic, I’m sure she’s very understanding. Besides, if a `Small’ should ask, you can always tell Rudyard Kipling’s `How the Camel Got It’s Hump‘ from the Just So Stories. You’ll have to figure out the `Heat’ bit for yourself, ‘coz it’s not in there. The energy that was heat can be partially dissipated (transformed) to other forms of energy. Thus the Infra-red radiation is transformed to atomic and molecular vibrations — from electromagnetic energy to atomic kinetic energy, and these energized particles move in bulk as collective movement of groups or aggregates of molecules within fluids, forming convective flows both in the air and in bodies of water. These convective flows help move the reactive particles and elements to come in contact with suitable chemical components to react with, and thus EM -> kinetic -> chemical bonds lock some of the energy away. Thankfully nature ensures that where and when energy is freely available life tends to proliferate and again chemistry, organic chemistry, will lock much more energy away. Plankton blooms, vegetative growth, and all the many processes of nature work to lock this energy away; more energy, more complex lifeforms living off the simpler forms accumulating more of this energy forming larger living structures — trees, crops, animals, etc. Some of the energy that that originally stated as infra-red energy will end-up being locked-up on this planet for many centuries — coal, fossils, dead plankton sludge that settles within the oceanic abysses. Using this energy to chemically reorganize the structure of millions of tons of organic matter daily. Life pushes against entropy locally — storing up and concentrating low levels of dilute solar energy into higher energy level structures. Though this can only happen for a finite time (sometimes for many millennia) it is real and happens continuously. Thus, that over-simplistic idea of energy in equals energy out on this planet is wrong, life massively corrupts that model. It’s good to keep a watch on the North Atlantic, because several independent studies and records suggest it is an area of the world which tends to pick up world temperature trends quicker and earlier than many other places. For example, much of the North Atlantic seemed to warm faster and earlier in the Medieval Warm Period, than many other places. Much of Greenland has been cooling since about the mid-20th century, and the if the area is now cooling, keep an eye out for the possibility of more regional areas to follow. Is the North Atlantic the focus of attention, because we happen to have more data about that region, as opposed to, say, the North Pacific? Or is there a fundamental difference between those two great bodies of water, that I am unaware of? My thinking also for quite some time past. What is so special about the North Atlantic except it is at the front door of the big European and American research institutes and universities and right hard up against the European and North American flesh pots. The North Atlantic and Atlantic has been criss- crossed since the days of the Vikings by Europeans and perhaps even some tens of centuries before that as the North American east coast Indian tribes have been found to have some recently identified genetic markers that are a genetic characteristic of Europeans. These genetic markers have not been found in the central and western North American Indian tribes. Secondly the location of maximum planetary solar warming is along and each side of the the Equator to the Latitudes of the Tropic of Cancer in the north and the Tropic of Capricorn in the south, both at the latitudes of 23-24 degrees north and south of the equator. These “Tropics” being the point where the Sun is directly overhead at the summer solstice each year before moving back again towards the equator. Therefore between these latitudes of the tropics the Sun has its largest warming effects. The equatorial Atlantic spreads over about 45 degrees of Longitude from northern Brazil to east Africa at Gabon and the Congo and Cameroon which are below its great western bulge, a span of longitude that is similar to that of the equatorial Indian Ocean. The difference being of course from the Indian Ocean that the Atlantic is open to the north and is heavily influenced by the inflows and outflows of very cold and dense Arctic Ocean waters in the North of the Atlantic. The Equatorial Pacific , the major solar heat absorbing global ocean region which includes the Western Pacific’s Warm Pool being the largest and warmest pool of ocean waters on the planet and by contrast with the Atlantic’s equatorial 45 degrees spread, spans some 140 degrees of Longitude. The Solar energy heat absorption of the equatorial Pacific is therefore around a very rough and ready three times the size of the Atlantic’s equatorial solar energy absorbing regions. So Rereke, your question is a damn good one and one that has never been answered in any science or climate writings I have so far read so far. Why is there so much concentration of the North Atlantic and so little apparent research on the northern Pacific ocean? We won’t even bother mentioning the South Pacific which is a rough, cold, remote ocean area far removed from the flesh pots of the major European and North American universities. With the ongoing collapse of scientific principles as is now being claimed by many science commenters, [ link & link ] the incentives are no longer to do good science for most so called scientists but to maximise grants and be a part of the tax payer funded troughers brigade. So why bother spending a cold, rough and uncomfortable time down in the South Pacific doing real observations when you can sit in a nice comfortable university room with all amenities and a computer and play a version of a scientific “war of worlds” modelling past time? You may have suggested the reasons for this difference, ROM – the North Atlantic has deep-water links with the Arctic Ocean; the North Pacific, though, has the Aleutian archipelago and the relatively shallow waters of the Bering Sea to act as barriers for that link. How does all this compare with the even less-trafficked (thus, less observed) waters of the South Pacific, which has no barriers at all to the Antarctic Ocean? More importantly the NAO is negative, which may explain the Paris floods. There are suggestions that the NAO and sun are somehow connected. It’s not consistent with ocean warming from greenhouse gas forcing either. Back to back East Coast Lows is a sign of SH regional cooling. The residents of Collaroy have been notified. Aunty tells the masses that ECLs are behaving naturally. ‘… its not unusual for east coast lows to develop in such quick succession. “On average, the eastern seaboard sees seven significant east coast lows each year and most occur between June and August,” he said. It’s far too soon to call yet, we need more years before a trend can be called. One swallow does not a summer make. Neither does one cold summer an ice age make, let alone a cooling trend. For all that, I think David Evans seems to have called it pretty well. In his first series of postings about his climate hypothesis, he said 2015 (one of the “hottest years evah! ” Yeah, right, well about 38% right according to Gavin) would be the earliest we could expect a downturn, and he seemed sure that 2017 would be noticeable. After what has been happening in the northern hemisphere this far into its summer , I’m now looking forward to the declaration of it being YAWY or Yet Another Warm Year early next year, or 2017. So far, David looks to be on track. Of course, my thoughts could easily be invalidated by this all turning to custard as the NH summer proceeds. But … so far … the summer seems to be custard. In the meantime, the well-lubed Lazee-Boy is in action, the beer stocks are high, and the popcorn has hardly been touched. I’m ready to see what happens with an ear cocked at the Graundia, and an eye on Gavin et al. C’mon Nature! Do your thing. I didn’t comment on the European Floods this year. nor did I comment on the 2013 floods, so I won’t. I won’t comment on the London and UK flash floods in earlier this month, either. You’ll also notice, I omitted all the Cold Weather in the USA, too. If you look, you’ll find June has not been a summer month across much of the Northern Hemisphere at all, this year. So I won’t mention it. We are in Bavaria at the moment. So far it has hit a high of 19C maximum on one day and less on the other three days we have been here. Cloudy with glimpses of sunshine, but not the summer the locals have been expecting. We were in Provence this time last year and it was 30+ every day. Heading back there on Saturday, so hoping for a bit more than 19! I hope you enjoy your stay in Bavaria and Province Peter. Thanks, Annie, a villa with its own swimming pool in a quiet little village is just what the doctor ordered! Summers in Europe will become wetter under a regional cooling regime and winters colder. Alpine glaciers will begin increasing mass balance. and watch the glaciers grow! el gordo , if you have the time can you elaborate on your claim , the article and related comments suggest drier conditions in the UK , which would give alarmists the excuse to blame drought on global warming , your saying the opposite , do you have any links for me to read , thanks . Sorry I can’t pull up a link but H H Lamb – Climate: Present, past and future. Vol 2. 1977 is my bible. ‘Schneefan at his site here writes about the unusually wet weather Europe has been experiencing lately. This has to be upsetting to global climate modelers and scientists, who years ago claimed Europe would have to expect hot, dry summers involving severe periods of droughts. Goodness me! Has anybody checked this out with those well-known climate scientists Leonardo Di Caprio or Naomi Klein. I refuse to believe what you have written above, Jo, until they have given their rolled-gold imprimatur on this issue. /sarc. Considering the much-adjusted NODC OHC data to 2000 meters continues to climb for the entire North Atlantic (not just the small portions shown in the climate4you graphs), one might assume there is an exchange of heat between the 0-700 meter depth and the 0-2000 meter depth. Outside of the obvious North Atlantic Current that’s part of the global thermohaline circulation, are there currents or mechanisms for displacing that heat from the 0-700m level to the deeper 700-2000m layer? And if there is such a mechanism AZ1971, just who or what threw the switch to make it happen right now, when a convenient explanation may be required by the exponents of CAGW. 21 August 2014: “The (Argo) floats have been very revealing to us,” said Prof Tung. The researchers say that there was another hiatus between 1945 and 1975 due to this current taking down the heat, that led to fears of a new ice age. From 1976 though, the cycle flipped and contributed to the warming of the world, as more heat stayed on the surface. But since the year 2000, the heat has been going deeper, and the world’s overall temperatures haven’t risen beyond the record set in 1998. I have abysmal news: The deep oceans are not getting warmer. OK, that sounds like a good thing. But hold your applause! Surface waters — everything above 1.24 miles — are still hot and getting hotter. It’s the deep ocean abyss that has not warmed measurably since we started keeping track in 2005, according to a new paper out in Nature Climate Change. The IPCC said 111 out of 114 climate models predicted a greater warming trend than was observed from 1998 to 2012. And for the period from 1984 to 1998, most models showed less warming than was finally recorded, they said. Who remembers climate scientists saying that oceans control the world temperatures 30 years ago? They’re ’avin’ a larf… right? How accurate are the thermometers they are putting on this buoys? I sincerely doubt they could be verifiably accurate to within 0.5°C, yet we are being expected to believe that they could show differences in the hundredths? Carry on the observation, and come back in about 50 years’ time – only then will we have enough information to be able to make reasonably intelligent guesses. Where mixing takes place of two water masses of fundamentally different properties, but similar density, the end product will have a higher density than the original components. The seawater in the ocean is layered by density. Two distinct water bodies, one tropical in origin with high salinity and high temperature and one polar in original with low salinity and low temperature can both have exactly the same density. If these water bodies meet and mixing occurs, then the colder water will warm and the warmer water will cool. The resulting mixed water will be denser than both of the parent waters and so it will sink into the ocean depths beyond the range of the sensors. Observe the bowed shape of the isopycnals (lines of constant density) in the salinity versus temperature diagram. Water having a salinity of 34.2 psu and 9 deg C with a density of 1030.995 mixed with water having a salinity of 32.7 psu and a temperature of 0 deg C with a density of 1030.981 will produce water with a temperature of 4.5 deg C a salinity of 33.45 psu and an increased density of 1031.108. Consequently the mixed water will sink. So why did the water at 700m cool? Is it because the isopycnal mixing process exports seawater water to depth and this movement allows the surface cooled polar water to replace it in the measured water column? The Atlantic Meridional Overturning Circulation (AMOC) is made up of a northwards flow of warm water in the upper layers of the Atlantic, which cools and sinks at high latitudes and a southwards flow of the cold dense water at depth. It plays an important role in our climate by transporting heat northwards in the Atlantic and keeping Europe relatively warm. Observations from the RAPID array have found a significant weakening of this circulation since the start of the observations in 2004, raising the question of whether this is part of an ongoing trend or part of climate variability. Thus it is possible that the recent weakening is a recovery from a period of anomalously strong circulation, rather than part of a long-term declining trend. Although there are uncertainties over what might happen in the short term, the longer-term view is that a weakening of the circulation in the 21st century is still very likely as a result of increasing greenhouse gases ??? Its game over, or is the heat going to disappear to where no one can find it (again)? Or is it now CAGCooling? I am sure that the Climate Pontificators will hatch some new Ratbag Theory if needed. Just like Mike’s little nature trick ! All possible scenarios are covered (just not predicted). I’m sure Sage Flannery will have some far-fetched idiocy being prepared for the ABC propaganda machine ! I suspect that the reasons for the cooling in the Atlantic are far more complicated than can be summed up in a short posting in a blog. And it has zero to do with climate change or any manmade catastrophe one could lay a finger on out of the myriads of climate and man created and predicted catastrophes currently in circulation and which are awaited with bated breath by the green and climate catastrophe cultists in their little inner city baristas and their expensive little rabbit food eateries. The model I will be using here is called the “Goldilocks Universal Estimation of S***t Science” , aka GUESS. 2 / One of the theories for this low Arctic ice cover was that a large volume of warm Pacific origin water entered the Arctic ocean via the Bering Strait between Alaska and Russia as the ice melted from the bottom up and not as most assumed and promulgated by the CC cultists from any global warming at 4C, melting the ice from the top down due to guess what, climate change and global warming! 3 / The open water with its low summertime ice cover allowed colossal amounts of heat energy from that warmer pool of possibly Pacific origin waters to escape into space. Far more heat energy escaped into space in fact than a decent ice cover would have allowed as it held a good proportion of that heat down under the ice and in circulation around the Arctic Basin. 5 / There was also a good inflow of warmer than normal [ if there is actually a "normal" at any level at all in any of this climate stuff ? ] North Atlantic waters into the Arctic basin at various depths around the mid 2000′s when the Arctic ice cover was at its lowest summertime area recorded. 6 / Plus the flow of the great Siberian rivers which pour huge amounts of water off the northern Eurasian continent into the Arctic ocean basin, which with the warmer seasons on the Siberian plateau enhanced the snow and permafrost melt upping the river flows into the Arctic Ocean basin. 7 / A higher proportion of heat energy in all these inflows into the Arctic basin was released and escaped into space due to the low ice cover during much of the latter part of the 2000′s and into the 2010′s so lowering the temperatures of the Arctic ocean waters over a much greater volume and to much greater depths than has been seen in the past. 8 / All that water that flows into the Arctic basin also eventually flows out of the basin and mostly into the north Atlantic around Iceland and Greenland. 9 / The deepest and coldest and densest Arctic waters are trapped within the deeps of the Arctic basin by a huge rock sill across the Denmark strait between Greenland and iceland. That rock sill is the site of the largest by far, waterfall or cataract on this planet as the deep very cold dense waters from the Arctic basin spill over the rock sill and enter and enhance and help create the very deep major north Atlantic ocean currents that go on to girdle the earth until eventually emerging again at the surface after anything from 600 to a thousand years later. 10 / If As I suggested further up, the volumes of very cold and deep Arctic basin waters have been enlarged through the heat escape due to the very low summer ice cover a decade or more back then the volumes of very cold deep Arctic basin water entering the North Atlantic over the rock sill in the Denmark Strait and another sill in the Greenland Strait will be considerably higher with a much enhanced cooling effect on the ocean waters coming up from the south in the Gulf Stream and in other major southern origin Atlantic ocean currents. Climate has to be measured in decades and this suggestion and suggestion is all it is in reality, seems to fit quite well with the current facts and circumstances. And it doesn’t need lots of contortions of all sorts of unproved hypothesis to sound reasonable. Occam’s razor is brought into play again. Well there’s its output of S***t Science so make of it what you may. My addled mind cannot decipher the three asterisks. Help please. Pleaze! hot,lan,noo,nov,nou,pla,pou,pur,qua,wea? Which? Are there others? Ah Will, thanks for the eye deer! Make up conclusions all on the slant. And when faced with some data, goes splat. Now I can go back to sipping some Glenfiddich rather than imbibing cheep beer and yelling at my neighbors! Thank you also Sir. Might I suggest a wee dram of Laphroaig, the spirit of the ocean. Your GUESS theory helps explain the apparent contradiction of North Atlantic cooling at the same time as Arctic Ice cover is apparently decreasing. Tony Heller at Realscience says Arctic ice is not decreasing. It is data manipulation by climate scientists. But let’s suppose that Arctic ice is decreasing and the North Atlantic Ocean is cooling. Increased clear water causing increased radiative heat loss would be a negative feedback mechanism, stabilizing the climate. That is in contra distinction to the positive feedback of less ice causing more heat gain from the sun due to the less reflective surface. Any and all that claim to know, scientifically, religiously, or politically, need be driven, with pitchforks, to the summit of nearest volcano, then offered the democratic choice of jumping into, or being thrown into said volcano! I agree both systems, ie solar heat being reflected from the very high albedo sea ice cover and / or the radiative heat loss from the Arctic waters when there is less or little sea ice cover. Which is predominant or which is operative at any specific time and ice cover I won’t even guess at! As for manipulating the data on Arctic sea Ice cover, yes I think some manipulation has gone on but independent non science observers in the maritime industry and the very limited recent opening of the North West passage after close to a half century of it being almost completely closed is a indication that the Arctic Sea ice is arguably down in area compared to a few years ago. But maybe not down as far in areas as it was in 1940 before Hitler’s armies invaded Russia and when the Russians were supposedly still allied with the Axis powers when the German auxiliary cruiser and raider the Komet , passed from west to east in the Arctic ocean across the top Russia and into the Bering strait and then down into the Pacific on a ship raiding voyage. It did have the help of a couple of Russian Ice breakers during its voyage across the Russian Arctic ocean areas. Proff. Ole Humlum’s site Climate4you which I give a lot of credence to as he is both a skeptic and is located in those northen regions in Norway has maps of the Arctic sea ice coverage for each month back to 2006. And there is little doubt that the Arctic sea ice area did decline quite a lot before appearing to stabilising at its approximate present coverage. Ole Humlum also has a sea ice historical maps derived from old ships logs and records of voyages a couple or more centuries back where the Arctic sea ice extended right down to the north of Iceland and then across to northern Norway,a thousand or more kilometres further south than is currently seen as the southern edge of the Arctic ice pack. I’ve seen some data on this a while back and I can’t think, or find, where. My recollection is that insolation over the arctic is so low that the change in energy budget due to changes in albedo is very low. The effect of ice cover on heat loss from the ocean is however significant. I’ll keep looking for a reference, it’s probably under my nose somewhere. Your point 5/ is perhaps the most perspicacious of all observations. Considering that we have been making detailed observation for such a short time, how are we to know what “normal” is? It seems that any change that is different from when observations started are deviations from the “normal”, but this seems to ignore the obvious point: could the conditions have been significantly abnormal at the start of the observations, thus we could be observing the reversion to normal? One genuine case in point is the claim that Arctic ice extent has decreased significantly “since satellite observation begun” – in 1979. However, satellite observation of the Arctic actually began in 1973; 1979 is when the ice extent was abnormally high; the present extent is little different from how it was in 1974. It reads like no one knows what is going on. It is not just the failure of all models, it is an admission that apart from casual observations about decadal osciallations and other grand heurisitic explanations, no one really has a clue. Lots of facts. No idea. Except that it is all due to aerosols and CO2, the only forces on the planet. Politically. Nah, it is because of the symbolic, but insignificant, acts of faith by governments such as the Paris Accords, the EPA’s Clean Power Plan, gutting of their nation’s economies, and re-installments of carbon taxes…Watch and see. Isn’t that the whole point? Isn’t that why scams, in any area of human society, are always successful? Mind you, the scammer has to know exactly when to cut and run, and they need to have a pre-prepared escape route, if they are to avoid retribution. I am not sure if the perpetrators of this current scam have such an escape route. I have been looking for one, to see if it can be closed off, but it is either well hidden, or not there at all. Wouldn’t it be sad, if they haven’t thought that through? It would not be sad! That is; cooling that is the result of Man caused warming don’t you know? Please get back to your desks for continued indoctrination. No, I take that back. It’s proof that carbon taxes work. Now go sit down. Then you’d be in favor of a carbon tax wherever you live then? And do you by chance live in California? I just had to ask that. No way could I avoid the temptation. Just when will that San Andreas thingy actually happen? “Can we go see it mommy?, and wave bye, bye! Can we, can we? It’s a well known fact that a watched pot never boils and an earthquake predicted never happens. So you’ll have to sit around wondering and waiting for it like the rest of us. Do we have a calculation of the number of Hiroshima’s that un-exploded? Well, well, well!!! I guess it’s official now, were getting colder, not warmer. But it’s still measured in fractions of a degree too small for me to understand why I should take it too seriously — since 2005 just down 0.45° C.
Oh well, there’s always the precautionary principle. Actually I suspect it is worth watching to see what happens. Even a drop of water at a time can fill a lake or an ocean if it goes on long enough — or drain it. Little bits of toenail wear away your socks. My Mother told me that when I was very small. I have yet to find a practical use for that information. But I continue to look. I think your search is over. You just did find a use for what your mother told you so log ago. So it was a good thing that you paid such close attention and remembered what she said. Otherwise, what would you have been able to say now? Nothing, I would think. And then where would you be? The Church have advised that we are likely to get colder, though not as cold as it might get. There is a studious omission of quantification, as there is of the idea that the theoretical and infinitesimal fraction of anthropogenic warming that failed to raise its head above natural variation could be beneficial under circumstances of natural variation that may involve significant cooling. The Fourth Estate predictably continues to treacherously fail in their civil duty. The entertaining thing is that the adjustment bureau may find themselves in a growing quandary, whereby the expanding distance between empirical measure and adjustment becomes the equivalent of day-light robbery and visible to all. Any heat wave anywhere is sign of global warming. Cooling of cause is only some sporadic change in local weather, nothing to see here, move on. This cooling has been going on for some years now, and may influence the weather at most of northern Europe and north America like the nino influences equatorial parts of the world. Cooling is a rare phenomenon, not visible immediately after homogenization. As we have seen in Australia, old data tends to cool with time past, creating the expected warming effect. These micro adjustments to the raw data are caused by CO2. … micro adjustments to the raw data are caused by CO2. I believe that CO2 is produced by the heavy breathing experienced during the act of micro adjustment to the raw data. 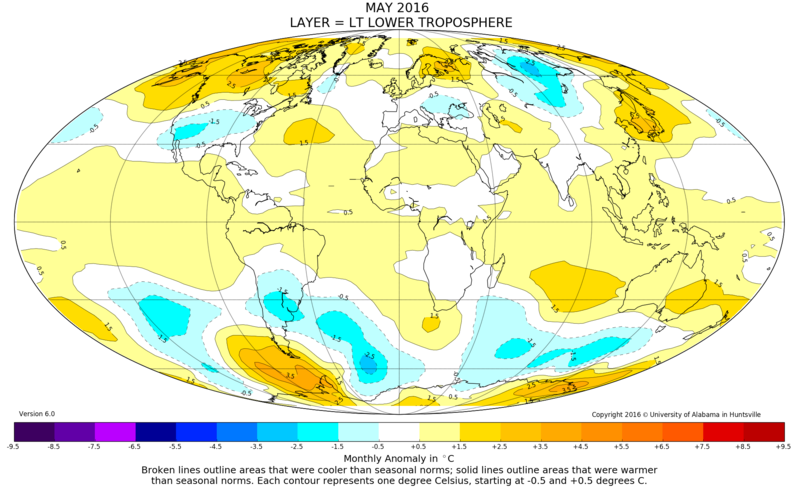 Meanwhile Ken Stewart’s May update for UAH V 6 satellite record shows no global warming for over 18 years. Many of the regions show no global warming for over half of the record. And the south polar region shows a slight cooling since Dec 1978. Bit of a problem for the CAGW extremists. Apologies… I know there is a method to contact directly and not but I can’t see it. thanks gee I was holding back commenting until I had looked more closely at the paper. I wonder how everyone else managed to get it? Also… see how this is published in an establishment journal with the usual suspects as editors and peer reviewers. Something must be going on here. Who is paying who? I’ve made it a few times. I hope it gets donations but I do worry about .ru sites. Yes, they can be a caution. But I doubt that site will last long – the commercial and academic forces arrayed against it are vast beyond belief, and implacably hostile. It undercuts the economic rationale for publishing and damages the peer-review model that academics like to keep away from us plebs (can’t have people looking for something wrong, as Philly Jones pointed out). In late May, NOAA announced that April also registered its highest temperatures ever, marking the twelfth consecutive month of record heat. Richard Betts, of the Met Office Hadley Centre and University of Exeter, is the lead author on the paper..
Just extrapolating (a lot) from the second graph, it would appear that the N Atlantic temperature last bottomed out about sixty something years ago. A figure of 66 years is often given as the cycle for the PDO. Is it a bit of a stretch to see that this coincides with the third overtone of the 22 year solar cycle. Maybe a bit of a long stretch, but something I keep filed away in the back of my mind. Perhaps a good dose of cooling due to ‘natural cycles’ will wake up all those people in Europe and N America to the rubbish that the green warmist machine has been churning out for (3) decades now! Much more than £100bn has been wasted in the UK preparing for a warmer climate (with the increased flooding and storms and droughts and rising sea levels etc)and trying to prevent all that lovely warming and extra plant growth. There is no money left to reverse the damage and to prepare for the cooling that will soon be with us. With an inadequate electricity supply (due to wind turbines and solar farms and woodburning power stations and no coal-fired power stations and closing nuclear power stations) there will be thousands if not millions of deaths, not to mention civil unrest when the lights go out. It wouldnt occur to these people that cooling (and warming) have just something to do with a certain type G star that we happen to be orbiting once in 365 days!!!! Solar downturn approaching! Cyle 24 finished, 25 will be even smaller. So what? Do you have anything, whatsoever to add to this now? right cheer, right now? You seem to dwell only on what may become, over yonder, later! Are the local chiggers biting your body now? Im not sure I understand your english..The ONLY thing that controls the atmosphere is the SUN .PERIOD. Not some trace gas that has been around in much greater levels in past epochs. As well it has NO effect on the climate what so ever as that would be breaking the laws of thermodynamics. Just another rant from some opposing insane religion. You also have no physical evidence that the Sun Controls anything!!! Not only does no one, nor group have any significant understanding of how atmospheric compressible fluid dynamics interact with ocean incompressible fluid dynamics, the whole incompetent religion of meteorology cannot even determine the amount of atmosphere, or why it is currently whatever it is! When it comes down to the manner that all solar system bodies influence each other, history shows that the ancient Astrologers, were much much better predictors of the upcoming than your so called infantile modern science! The conveyor is operating normally, no need for concern. Could anyone figure out how many mm the sea level will sink because of that cooling? With the ice levels increasing..probably quite alot! Greenland is at record ice levels, Antarctica (Vostok) has had record low temp..-80C!!! So much for summer in the NH ..